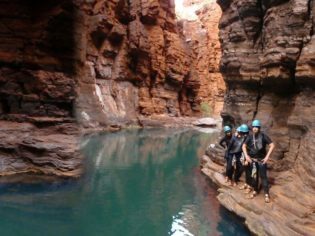 Abseiling in Karijini National Park. 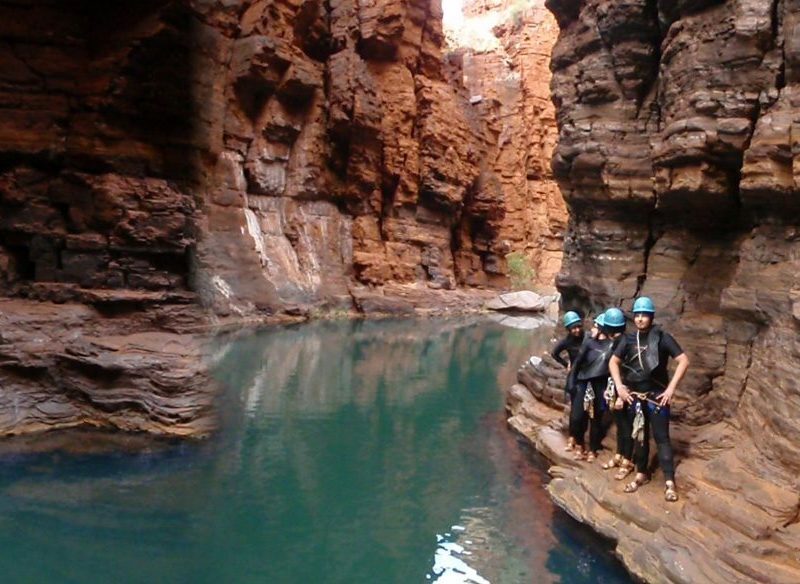 Samantha Alexander delves into Red Gorge for a day of abseiling within Karijini National Park. There’s nothing better than being in the moment. Going with the flow, being spontaneous and doing things you wouldn’t usually do. On a recent journey through Western Australia this sums up most of my trip. One place however, that this was especially true was Karijini National Park. I had explored much of the area on foot but wanted to see more. Enjoying being amongst nature and feeling free, I decide to book in for an adventure tour and lock myself in for an 8am departure in two days time. This is to be my first time abseiling. The day soon arrives and happily rugged up to combat the cool morning Pilbara air, I join the tour group. An unexpected costume change shortly ensues as I find myself stripping down then zipping up an extra warm shark skin wetsuit. With bright blue hard hats in tow, our small group of eight boards the mini bus for Red Gorge. Along the way our tour guide, Dan, hands each of us our own inflatable tube, while advising to treat it ever-so preciously. “If it pops, you’re swimming” he says, explaining there are no back-ups. After a short hike into Knox Gorge, we arrive at the first challenge for the day. As directed by Dan, we jump into a large pool of water below – the challenge being that the water is surprisingly cold, so much so it takes my breath away. From here, there’s no turning back. We venture on to the narrowest point at the end of the gorge, where the real fun begins. It is here that a four-metre drop awaits, but we make our way down via a rock waterslide that has been carved from years of erosion. Like big kids, we take our turn sliding down the ancient grooves and into another pool below. It is so much fun and I want to do it again, but this is a one-way adventure. From here we prepare for to abseil down into the following pool. We line up and one by one, Dan lowers us down the rockface. At the bottom of the slide we regroup on a little island before continuing into Red Gorge. The brief break is a great chance to let the adrenalin subside and take in the grandeur of this isolated environment. Once all accounted for, we venture on. The swim out to Red Gorge is very chilly so we keep moving to ensure we don’t freeze. The sun hasn’t yet risen above the 150-metre high walls of the gorge system to thaw us out. Luckily for us though, Dan has managed to bring along a thermos of hot chocolate for morning tea. Floating through Red Gorge on board our precious tubes, we stare in silence. This is perfect. Tranquil, calm and soothing. I could float all day, looking up at the towering red cliff-face. After a light lunch we head into what is known as the ‘centre of the earth’ in Hancock Gorge. It seems surreal navigating the narrow winding rock face. Words really can’t describe this section, it is just magical. Finishing in style we get excited about a good old fashioned rock climb – ropes at all. Never having done this before I look to Dan for assistance and before I know it I am at the top. Not a super difficult climb, but I am still very proud of myself. As we make our way to the surface again I wonder where day went. This was an experience I will never forget. There is more than meets the eye at Karijini and lucky for me I got a few more memories than most.